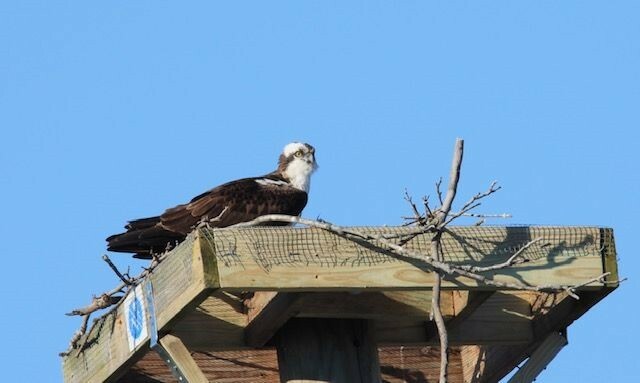 Westporters rejoiced — and relaxed — this morning, as Westport’s 2 favorite ospreys returned to their home. Overnight, Regency Centers — owner of the Fresh Market and Terrain properties — reconstructed the platform that, less than 48 hours earlier, they had removed. But there was no rest for the ospreys. As soon as they could, they began rebuilding their nest. Carolyn Doan captured these mesmerizing photos of the magnificent birds at work. 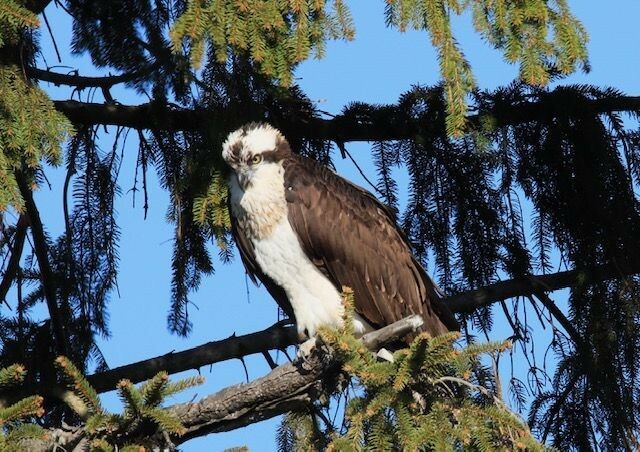 This entry was posted in Environment and tagged ospreys. Bookmark the permalink. Hurray, Thanks Dan for all your attention to this. Yayyyy!! Voices together… thanks to everyone who raised them! Yayyy! thanks to everyone who raised their voices – together…. Fabulous news. Kudos to you dan for getting this story out and big thanks to Carolyn for the spectacular photos. A memorable community effort. Happy day. I salute Dan W. for basically enabling the Town of Westport to collectively go after Regency who were the bad actors and force them to correct their flawed judgement in taking down the osprey next. Dan you are the hero here and all of us and the ospreys can’t thank you enough. I AGREE WITH EVERYTHING ABOVE ESPECIALLY TO DAN WITHOUT WHOM THIS WOULD NOT HAVE HAPPENED. YOU’RE A PRINCE; AND IN THE BIRD WORLD YOU’RE AN EAGLE!! Thanks, Tom. We’re all in this together! I agree with Tom and all the others. With out Dan this never would have happen in a timely manner or sadly not at all. Yea Dan Woog. We should press for Regency to either bring back or help identify a source for lots of the sticks and other nest materials to make it easier for them. Their contractor must have taken them someplace. I’ll send an email to Jack and copy their CEO in FL. Anyone else! I was thinking the same…where is the old nest or can we provide suitable materials at their base so they don’t have to travel far for forage or is the human touch poison so to speak? I agree. Why make them catch up? The eggs are probably stressed already. Perhaps they don’t like human contact with their nest so if so I understand. But if not why not finish the job and give them some sticks asap. If the birds don’t mind this makes the job still incomplete. There are no eggs as of yet. 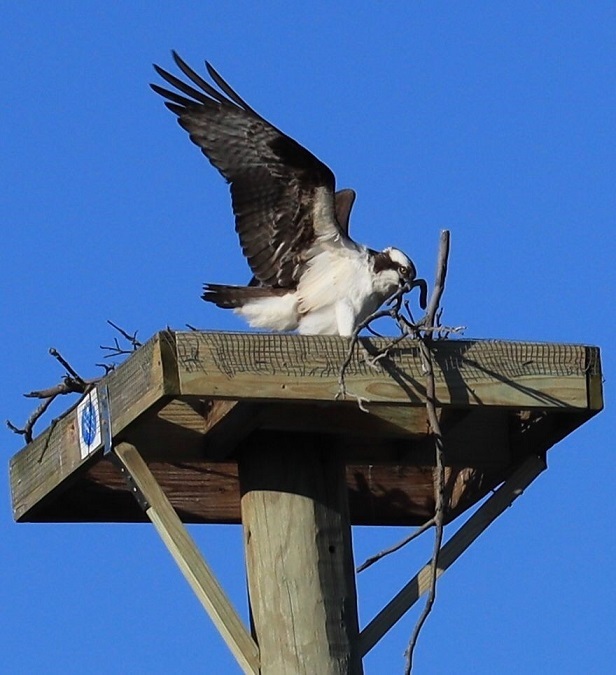 It is debatable whether there will be a successful next generation due to timing of rebuilding their nest & the amount of stress the Osprey were under having lost their original nest. The Osprey are better off without further human interaction, other than to gaze up at them in total delight & amazement as so many of us have done over the last many years. Social Media gone so right! Thank you Dan W for keeping everyone up to the minute on this important story! A triumphant ending indeed. Thank you and all your followers who remained vigilant all weekend! I’m feeling so full of joy, I’m not sure my little heart won’t burst! Thank you everyone, particularly Dan. Congratulations to 06880 and all Westporters involved. This shows what good community communication and good will can accomplish. Great work! Contrary to wide spread rumor, birds do NOT eschew nests because of human contact. These guys will most likely do just fine now that their abusers have seen the light. I cannot attend the meeting on Thursday, but recommend a fine for the illegal removal of an active osprey nest. I agree with Jalna … the perps should be fined. If they don’t mind human contact with their nests where is the Audubon Society? Again only if it’s true it’s time to put all the fundraising they ask for it to good use. Is best to leave wildlife be. They will do fine, now that the platform is back. Great story. Glad you brought attention to it. Thanks Dan, our Town Crier! Great pictures! They look much happier and relaxed. Can we name them Dan and Dani? Enough. Many, many people brought this situation to light, Dan included. It took a village !! the pair. Can hardly wait for Chicks! And, how about “Caesar and Cleopatra”? Strong, smart, beautiful, persistent and close to the gods. Let’s show Dan Woog our (and the ospreys’, no doubt) appreciation for the important role he played in making this happen by supporting 06880. Thanks, Jessica – you rock! I’m proud to be a Westporter after the Osprey Saga. Thanks to the people who tried to stop the workmen, the photographers who documented the event, the ones who reported it and followed up, and most of all, 06880. This nest is one of over 600 in CT, many monitored by CT Audubon volunteers. Dan my wife nickname them years back when they originally nested at the fire station Pole. Sparky and Blaze. And they certainly sparked controversy and set ablaze the town! Thank you, Dan, and everyone who got this wonderful result. Any new pictures of the nest?